Nobody could have foreseen what would happen the day that Rose McKenna volunteers as a lunch mom in the cafeteria of her daughter’s elementary school. Rose does it to keep a discreet eye on her third-grader, Melly, a sweet, if shy, child who was born with a facial birthmark that has become her own personal bull’s-eye. Melly has been targeted by the mean girl at their new school and gets bullied every day, placing Rose in a no-win position familiar to parents everywhere. Do we step in to protect our children when they need us, or does that make things worse? When the bully starts to tease Melly yet again. Rose is about to leap into action―but right then, the unthinkable happens. Rose finds herself in a nightmare, faced with an emergency decision that no mother should ever have to make. What she decides in that split second derails Rose’s life and jeopardizes everyone she holds dear, until she takes matters into her own hands and lays her life on the line to save her child, her family, her marriage―and herself. Lisa Scottoline has thrilled millions with her inspiring female characters and her exploration of emotional justice, writing about real issues that resonate with real women. 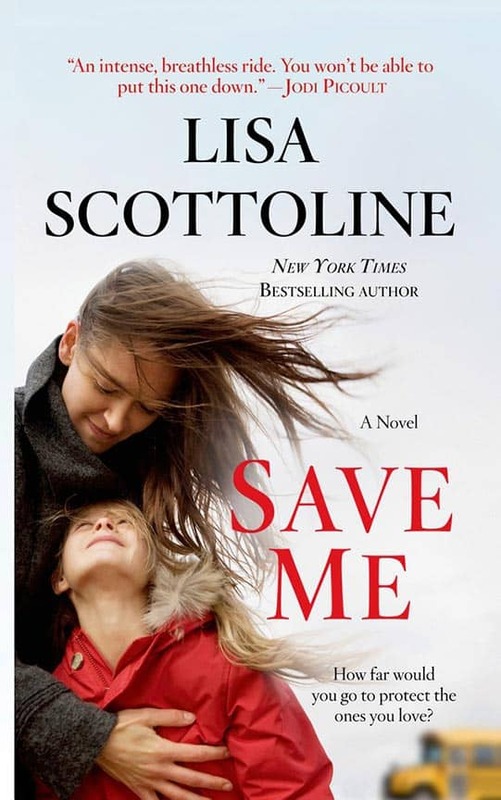 In Save Me, she returns with her most stirring and thought-provoking novel yet. Rose McKenna stood against the wall in the noisy cafeteria, having volunteered as lunch mom, which is like a security guard with eyeliner. Two hundred children were talking, thumb-wrestling, or getting ready for recess, because lunch period was almost over. Rose was keeping an eye on her daughter, Melly, who was at the same table as the meanest girl in third grade. If there was any trouble, Rose was going to morph into a mother lion, in clogs. Melly sat alone at the end of the table, sorting her fruit treats into a disjointed rainbow. She kept her head down, and her wavy, dark blonde hair fell into her face, covering the port-wine birthmark on her cheek, a large round blotch like blusher gone haywire. Its medical term was nevus flammeus, an angry tangle of blood vessels under the skin, but it was Melly’s own personal bull’s-eye. It had made her a target for bullies ever since pre-school, and she’d developed tricks to hide it, like keeping her face down, resting her cheek in her hand, or at naptime, lying on her left side, still as a chalk outline at a murder scene. None of the tricks worked forever. The mean girl’s name was Amanda Gigot, and she sat at the opposite end of the table, showing an iPod to her friends. Amanda was the prettiest girl in their class, with the requisite straight blonde hair, bright blue eyes, and perfect smile, and she dressed like a teenager in a white jersey tank, pink ruffled skirt, and gold Candies sandals. Amanda wasn’t what people pictured when they heard the term “bully,” but wolves could dress in sheep’s clothing or Juicy Couture. Amanda was smart and verbal enough to tease at will, which earned her a fear-induced popularity found in elementary schools and fascist dictatorships. It was early October, but Amanda was already calling Melly names like Spot The Dog and barking whenever she came into the classroom, and Rose prayed it wouldn’t get worse. They’d moved here over the summer to get away from the teasing in their old school, where it had gotten so bad that Melly developed stomachaches and eating problems. She’d had trouble sleeping and she’d wake up exhausted, inventing reasons not to go to school. She tested as gifted, but her grades hovered at C’s because of her absences. Rose had higher hopes here, since Reesburgh Elementary was in a better school district, with an innovative, anti-bullying curriculum. She couldn’t have wished for a more beautiful school building, either. It was brand-new construction, just finished last August, and the cafeteria was state-of-theart, with modern skylights, shiny tables with blue plastic seats, and cheery blue-andwhite tile walls. Bulletin boards around the room were decorated for Halloween, with construction-paper pumpkins, paper-mache spiders, and black cats, their tails stiff as exclamation points. A wall clock covered with fake cobwebs read 11:20, and most of the kids were stowing their lunchboxes in the plastic bins for each homeroom and leaving through the doors to the playground, on the left. Rose checked Melly’s table, in dismay. Amanda and her friends Emily and Danielle were finishing their sandwiches, but Melly’s lunch remained untouched in her purple Harry Potter lunchbox. The gifted teacher, Kristen Canton, had emailed Rose that Melly sometimes didn’t eat at lunch and waited out the period in the handicapped bathroom, so Rose had volunteered as lunch mom to see what was going on. She couldn’t ignore it, but she didn’t want to overreact, walking a familiar parental tightrope. “Oh no, I spilled!” cried a little girl whose milk carton tipped over, splashing onto the floor. Rose tossed out the soggy napkin, then heard a commotion behind her and turned around, stricken at the sight. Amanda was dabbing grape jelly onto her cheek, making a replica of Melly’s birthmark. Everyone at the table was giggling, and kids on their way out pointed and laughed. Melly was running from the cafeteria, her long hair flying. She was heading toward the exit for the handicapped bathroom, on the right. Amanda tilted her face down to hide her smile, but Emily and Danielle stopped laughing, their faces reddening. “I didn’t do anything.” Emily’s lower lip began to pucker, and Danielle shook her head, with its long, dark braid. “Me, neither,” she said. The other girls scattered, and the rest of the kids hustled out to recess. Amanda didn’t reply, setting down the crumpled napkin. “Look at that bulletin board. See what it says?” Rose pointed to the Building Blocks of Character poster, with its glittery letters that read CARING COMPASSION COMMUNITY, from Reesburgh’s antibullying curriculum. “What’s going on?” someone called out, and Rose looked up to see the other lunch mom hurrying over. She had on denim dress and sandals, and wore her highlighted hair short. “Hi, Amanda.” The lunch mom turned to Rose. “We have to get everybody outside, so the kitchen can get ready for B lunch.” She gestured behind her, where the last students were leaving the cafeteria. “Whatever, it’s not going well.” Terry nodded toward Emily, just as a tear rolled down the little girl’s cheek. “Can I just finish what I was saying to them? That’s all this requires.” Rose didn’t want to make it bigger, for Melly’s sake. She could already hear the kids calling her a tattletale. “Then I’ll go get her myself.” Terry turned on her heel and walked away, and the cafeteria fell silent except for the clatter of trays and silverware in the kitchen. Rose blinked, surprised. She’d be damned if she’d be intimidated by somebody in a Hannah Montana headband. “I’m not yelling at you,” she said calmly. “I’m going to recess!” Amanda jumped to her feet, startling Emily and Danielle. Suddenly something exploded in the kitchen. A searing white light flashed in the kitchen doorway. Rose turned toward the ear-splitting boom! The kitchen wall flew apart, spraying shards of tile, wood, and wallboard everywhere. A shockwave knocked Rose off her feet. A fireball billowed into the cafeteria. And everything went black and silent. Save Me explores the mother and child relationship, at its heart. What do you think defines a mother? How is a mother and child relationship different than any other relationship? Look at other forms of culture, like art, for example. How many depictions are there of mother and child? And how many of father and child? Are we discriminating against fathers, or diminishing them, by all this talk of the mother-child bond? And by doing so, do we create a self-fulfilling prophecy? In Save Me, Melly is the victim of bullying because of a birthmark on her face. Do you think bullying is different today than years ago? Do you think that the bullying is getting worse, or are we just hearing more about it because of the Internet? What do you think parents and schools should do to help curb bullying? What kind of punishment do you think is appropriate for the child who is doing the bullying? What about those who watch and say nothing? Are they, or aren’t they, equally as culpable? Do you think that school programs and curricula that build up self-esteem and a sense of community will really make a difference? Rose experienced her own bullying at the hands of the angry parents, which gave her new perspective on what Melly was going through. Do you have any experience with bullying between adults? In what ways are adults better equipped to deal with bullying than children? What impact can bullying have on adults, and what can an adult do if they are faced with a bully? What impact does being a bully, or being a bully as an adult, have on their children? Rose steps in to defend Melly against her bully. Do you think it was a good idea? Why or why not? How do you think a parent’s involvement hurts or helps the situation? At what point do you think a parent needs to involve themselves in the situation? What steps would you take to help your child if they were being bullied, and how far would you be willing to go? What impact do you think a physical blemish has on a child, and how do you think it effects their identity, their relationship with their family, and their relationship with the outside world? Take it a step further — like how about physical differences, like a child in a wheelchair? Or learning challenges, that aren’t so visible? Or how about discriminations based on race, religion or sexual orientation? Melly’s father reacted very badly to Melly’s birthmark. What did his reaction make you feel about him? Many of Lisa’s books center on single mothers or blended families. Do you think the love of one great parent is enough to sustain a child through life? Does it take a husband, too? Or a village? As Rose found out, volunteering comes with risks. The book makes clear that this is a problem in the law of many states, maybe even where you live. What do you think of the laws in terms of protecting those who volunteer their time? What changes, if any, would you make to the laws to protect volunteers? Should we expand the Good Samaritan statues to include volunteers and to encourage even more people to volunteer? How did you feel about Rose keeping her secret past from Leo? Did you understand her reasoning? Did you agree or disagree with it? What impact do you think Rose’s past will have on her marriage as she moves forward? Do you think she will ever really be able to escape what happened? Will he forgive her not telling him? How do secrets impact intimacy in our lives? Rose was called a “helicopter” parent, a term often used in today’s society with a negative connotation. What separates helicopter parenting from good parenting? What kind of parent do you think Rose was? What mistakes do you think she made? Do you think she was a good mother? Do you think she favors Melly, or the baby? Or treats them equally? How did you feel about Amanda in the beginning of the book? How, if at all, did your opinion of her change by the end of the book? What do you think causes children to be bullies? Under what circumstances would you ever feel bad for the bully? In punishing a bully, do you think their personal circumstances should be taken into account? What did you think of Rose’s lawyers’ strategy? Did you agree or disagree with it? Why or why not? Do you think they were just passing the blame, or do you think the school had a responsibility in what happened? Do you think that litigation is another form of bullying? Do you know anybody who is sue-happy?